On Tuesday morning, I buckled down and straight-line quilted the blue ombre. This is a sample for Rock Paper Scissors, so the lovely Beth chose the backing fabric. It’s not one that I would usually use– I tend to be drawn to more geometric prints– but I have fallen in love with the green and teal leaf pattern from Simply Color. I can’t look at it enough. That has happened to me a few times lately, specifically with the Shelburne Falls line by Denyse Schmidt. A lot of bloggers had hyped the new fabric, and I try not to fall for something just because of hype. I also try not to buy fabric just because I like it– I try to have a plan for everything that I buy. 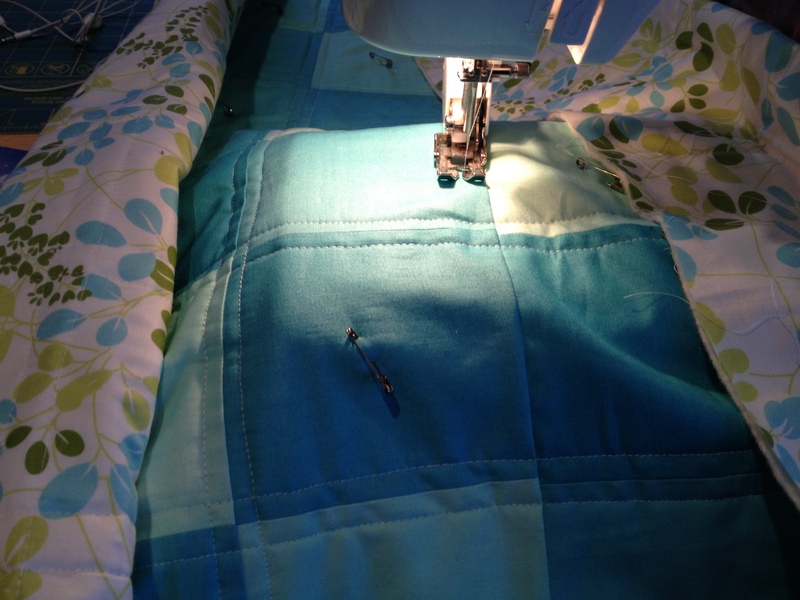 It’s not easy, but I do have a quilting budget, after all. I decided on a color scheme for my Block Party quilt before choosing the fabric, and instantly fell for the more geometric print in the blue colorway of Shelburne Falls. Then I chose the blue and yellow floral to tie a few of the colors together. Florals aren’t really my thing, but the colors were great, and I thought that it was interesting to look at. Then, when I was cutting last weekend, I found myself just looking at it to look. I really loved that fabric. It’s floral but a little edgy, both vintage and modern. And suddenly, I needed to have it. All of it. The whole line. It was a crush, completely irrational. I had to project for it. And yet it had to be mine. The other fabric that I became obsessed with is Twiggy Leaf in red from Oh Deer. I realized that this fits into my leaf obsession but also resembles a print on my own quilt from my childhood, the quilt that made me want to make them myself. I had to have it too. And so, because this is now the longest, most anti-climactic blog post ever, I bought them. And I just look at them and smile. 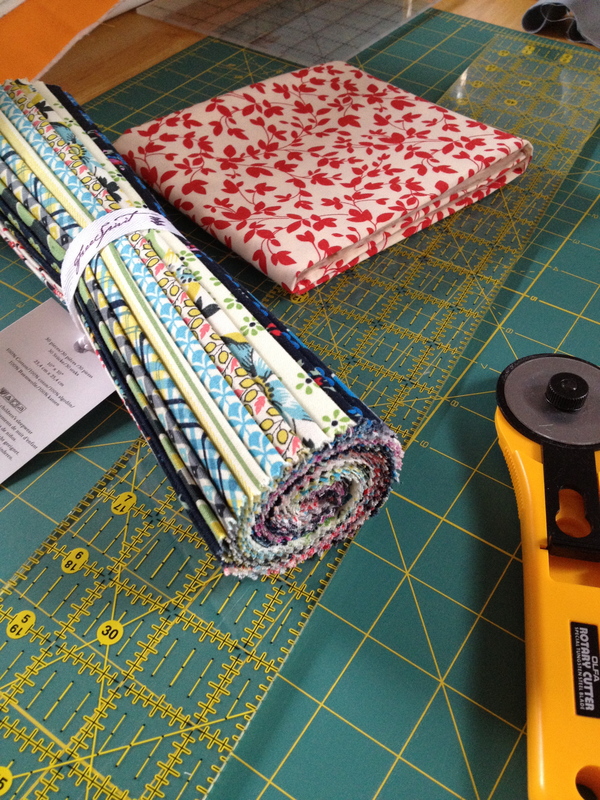 This weekend I’ll be workshopping my free motion quilting class. I’m looking forward to hanging and sharing and talking with everyone. Love this! The blues are so pretty! Your quilting is so nice and even. 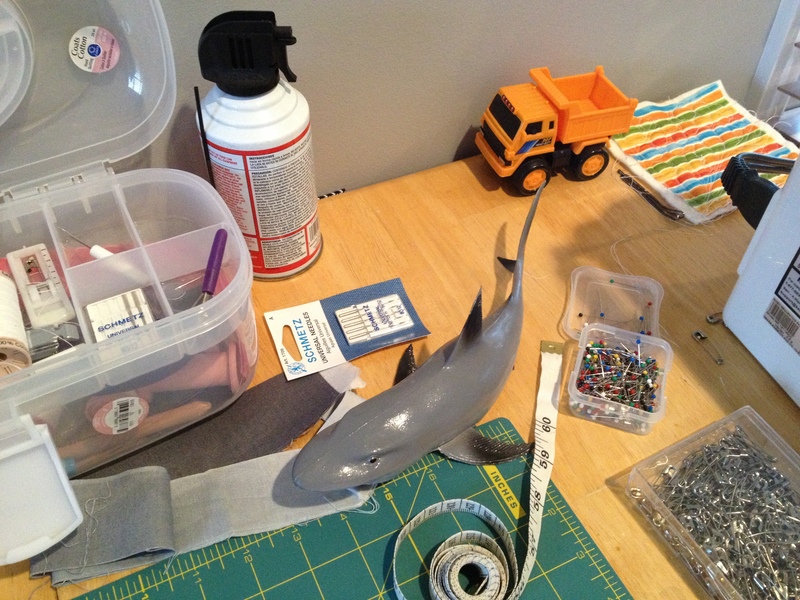 I would say something about shark helping you but then realized that sounded really woo-woo-weird.